30cm (11.8'') high, 31cm (12.2'') wide and 18cm (7.1'') thick. Animal-head terminal, dated to eighth century. 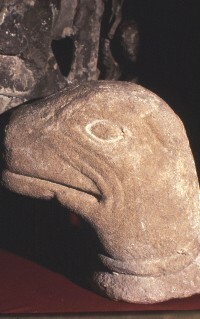 The animal-head is three dimensional. It is something between a mammal and a reptile, with a short squared-off snout and a long slit mouth. Cramp, R.J., Corpus of Anglo-Saxon Stone Sculpture, Vol. 1, County Durham and Northumberland. 1st, Oxford University Press, Oxford (1984) Stones, Sculpture, Anglo-Saxons, England..